Our Four Point Inspection evaluates four major systems – HVAC, electrical, plumbing, roofing – for insurance company policies. Our Four Point Inspection ensures that insurance companies have documentation required to issue a homeowner’s policy. 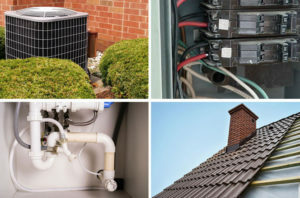 The inspection focuses on four main categories – heating, ventilation, and air conditioning), electrical wiring and panels, plumbing connections and fixtures, and roofing. Our Four Point Inspection assesses the condition of four major categories and provides information about the types of maintenance required to keep the components operating property. We deliver results in a report that is mandated by insurance companies in Florida.